Almost a thousand years ago, travellers journeyed across vast oceans to the tiny island of Meedhoo in Addu atoll, bringing a new way of life that would forever change the mysterious Maldives archipelago; or so the story goes. With little evidence of the Maldives’ ancient origins surviving, clues to the countries past are few and far between. But not in Meedhoo. Here lie the men who were among the first to bring Islam to the islands in the early 12th century. Just yards away from their charming and historic place of rest amid swaying palms and coral walls is the Charming Holiday Lodge. It is from here that you can truly appreciate the rich culture of island life – past and present. With the country’s recent conversion to guesthouse tourism just beginning to make an impact in the atoll, Meedhoo is still largely untouched by today’s travellers. Visitors to the Charming Holiday Lodge, however, can explore in comfort, returning to spacious and air-conditioned rooms at the end of each day’s discoveries. 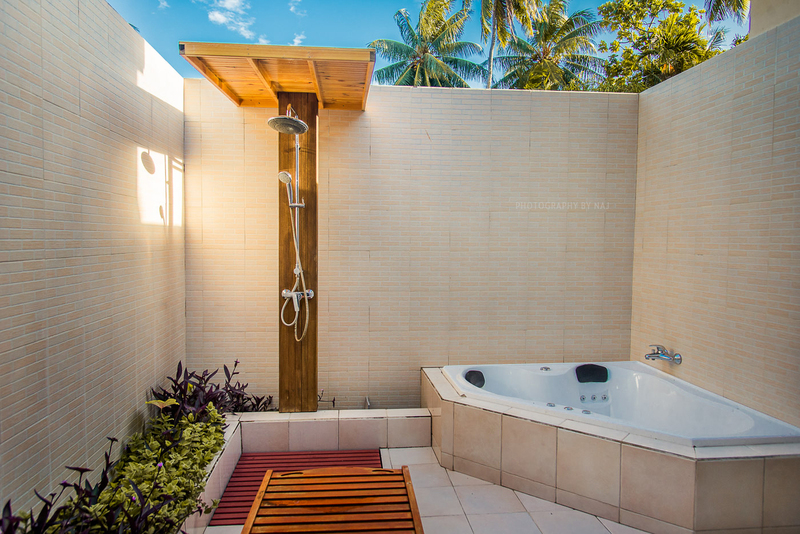 All rooms are supplied with luxurious furnishings, flat screen televisions and wi-fi, giving a comfortable base from which to dip into island life (guests in the deluxe suite can do this more literally, with an outdoor shower and bathtub). 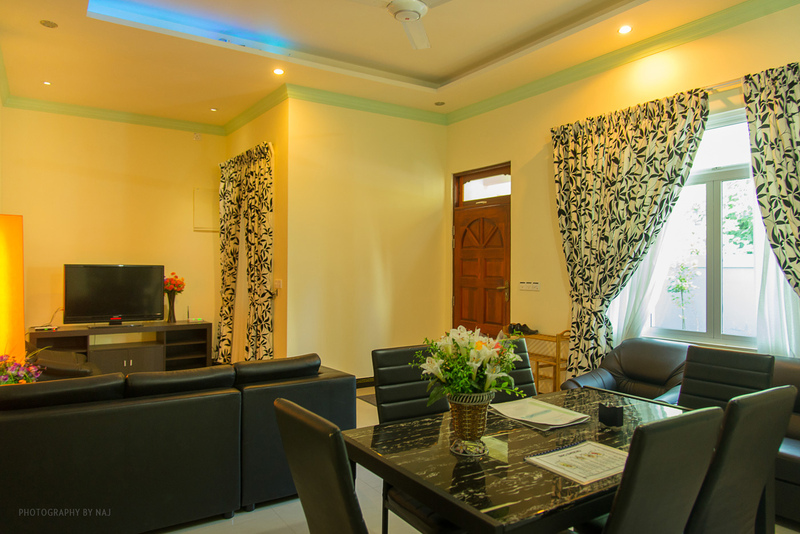 The property’s four rooms, communal area and kitchen can also be rented for private groups – accommodating up to eight people. Local culture is something those at the Charming Holiday Lodge are particularly proud of, with guided island tours – and bicycles – provided free of charge. 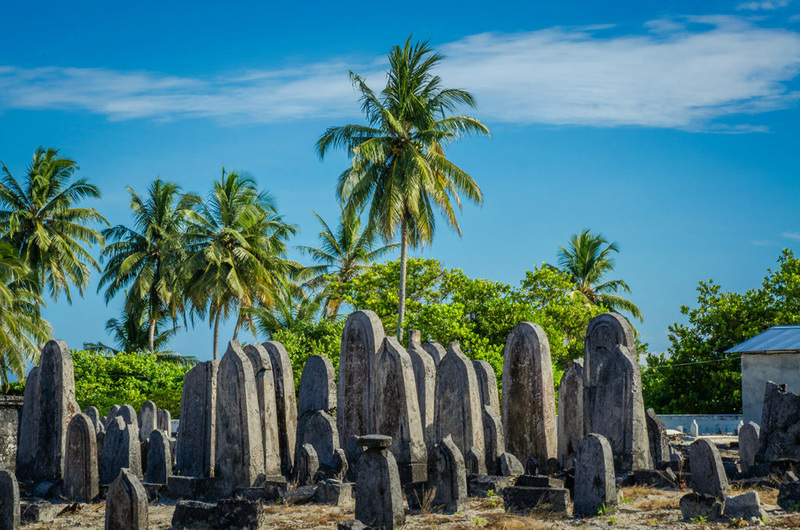 Your visit to Koagannu – the oldest cemetery in the country – will live long in the memory, while nearby gun mounts places by the British during the second world war hint at the island’s more recent place in history. The wide variety of locally-grown fruit and vegetables are a must if you are to attempt to copy some of Addu’s recipes, lovingly collected by your hosts. The fully stocked kitchen ensures you’ll have plenty of time to perfect Boafolhi (a sort of coconut pancake), Geshi Bankeu (indescribable!!) and many more. 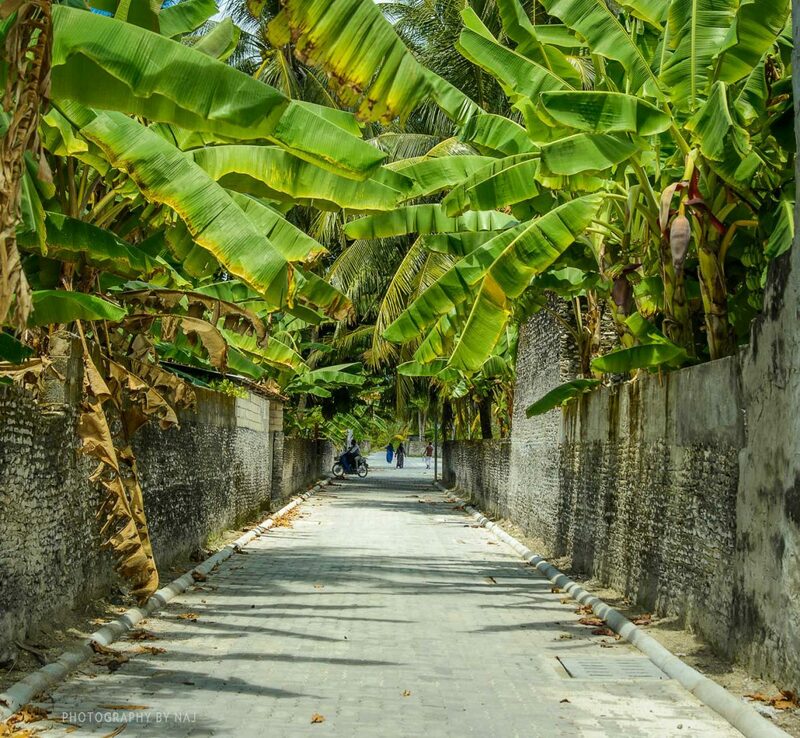 Despite its busy history, Meedhoo is a quiet place with a population of just under 2000. A further 1,200 people live on the same island, although the southern district of Hulhudhu is regarded as a separate island. References to ‘Hulhu-meedhoo’ are bound to leave you confused for the first few days, though asking locals for the answer to this mystery is often a good way to return the favour (count the different explanations you hear). Large parts of the island are still covered with thick tropical foliage, the perfect home for fruit bats and the atoll’s famous white tern (known locally as the dhondheeni), who glide lazily over the sleepy island throughout the day. The usual pleasures of the atolls are also available to guests, taking to the ocean to spot dolphins and to fish, while the lodge can also arrange beach barbecues and trips to nearby uninhabited islands. The Canareef resort – connected to Hulhu-meedhoo by a small bridge to the south – can also be accessed for day-trippers looking to use its facilities, including pool, spa, gym, and bars. But perhaps the best way to succumb to the timeless tropical trance is order a coffee in a local cafe (lodge staff can recommend the best places) and let the island show you its charmed life. Watching islanders saunter over the sand to gather and gossip outside their homes, interrupted only by the call to prayer drifting over the towering palms. 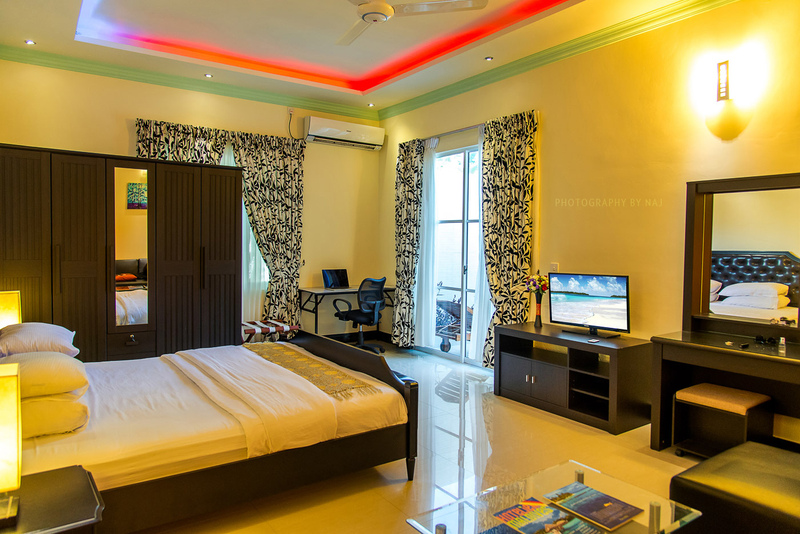 Meedhoo’s gentle sway is sure to leave you hypnotised during your stay at the Charming Holiday Lodge. Meedhoo can be reached by flying to Addu’s Gan International Airport from the capital Male’ or Colombo. From Gan, a five minute car ride will take you to Feydhoo ferry terminal from where regular ferries travel across the lagoon to Meedhoo. Alternatively, the Charming Holiday Lodge can arrange speedboat transfers from Gan.